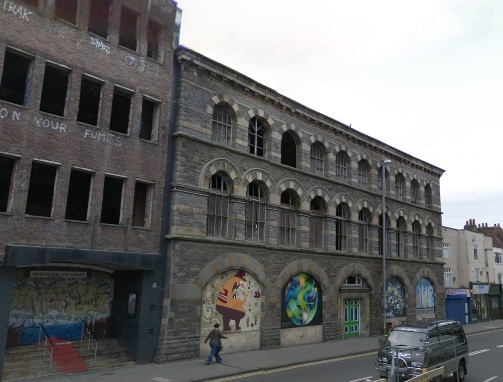 Knightstone Housing Association have been chosen by Bristol City Council as the preferred developer of the Grade II* listed Carriageworks and adjacent Westmorland House on Stokes Croft. Working with the Council and the Carriageworks Action Group (CAG), Knightstone has drawn up three possible options for development, following a series of community workshops. The site, which has lain derelict for many years and become an embarrassing eyesore, also contains 4 Ashley Road, a derelict Grade II listed house. Planning consent was granted in 1989 for the development of 63 flats, offices and underground parking. Another application for 153 flats, 5 shops and 112 parking spaces was refused on Appeal in 2010. The London-based owners, the Comer Homes Group, submitted a further application in 2011 for 183 flats, shops and parking; this has not yet been determined. Assistant mayor with responsibility for strategic housing and planning, Councillor Mark Bradshaw, says: “We still have a long way to go to bring this gateway site, which has lain derelict far too long, back into use but we are a significant step closer now. Negotiations with the site owners are on-going but, should these fail, the Council has approved a decision to proceed with a Compulsory Purchase Order. St. Michael the Archangel on the Mount Without: Prayers to be answered at last?